Since late October, 2013, protesters across Thailand have taken to the streets, occupied rally sites, seized government buildings and made their grievances known to the world. They stand in opposition of the regime of Thaksin Shinawatra – a Wall Street-backed billionaire autocrat, convicted criminal, accused mass murderer, and fugitive who is openly running the country from abroad via his nepotist appointed proxy, his sister, Yingluck Shinawatra. 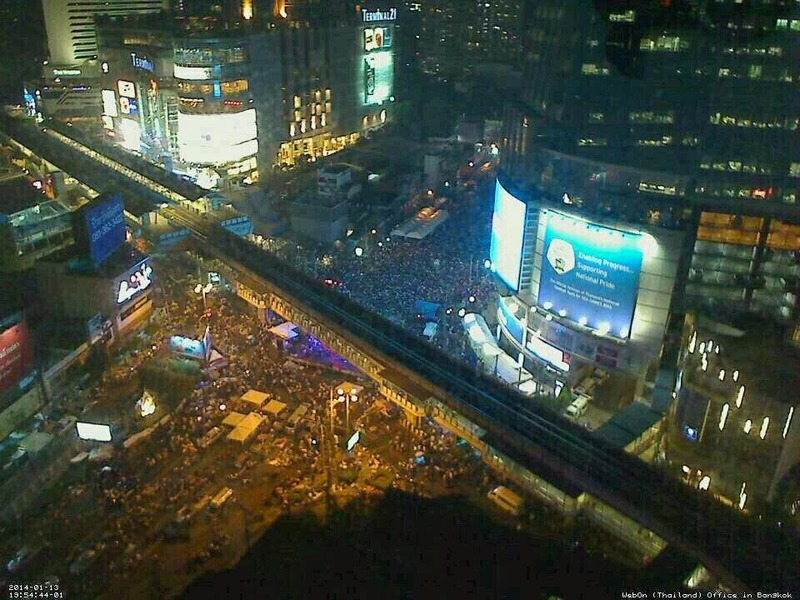 Not entirely unlike other protests seen unfolding around the world, large mobilizations have periodically flooded the streets of Thailand’s capital city of Bangkok, at times attracting over a million protesters. Image: One protest leader, Buddha Issara, traded in placards for pragmatism, purchasing a rice mill and operating it at his rally site in northern Bangkok. The mill is processing rice from destitute, desperate farmers and creating an ad hoc farm-to-city market to put cash from consumers directly into the hands of farmers as opposed to the corrupt middlemen and regime warehouses overflowing with unsold, rancid rice. If Thailand’s political future is decided by actions rather than words, anti-regime protesters like Buddha Issara and his followers are well on their way to victory. Others would be wise to follow his sage example not just in Thailand, but around the world. Find more images via ASTV’s Manager.co.th. However, unlike many protests, particularly those promoted heavily by the Western media, including the so-called “Arab Spring” and the recent “Euromaidan” protests in Ukraine later found out to have been led by Neo-Nazis and ultra-nationalist parties with Hitleresque names like the “Fatherland Party,” hollow slogans such as “democracy” and “freedom” in Thailand are overshadowed by more specific, better articulated, and enumerated demands. 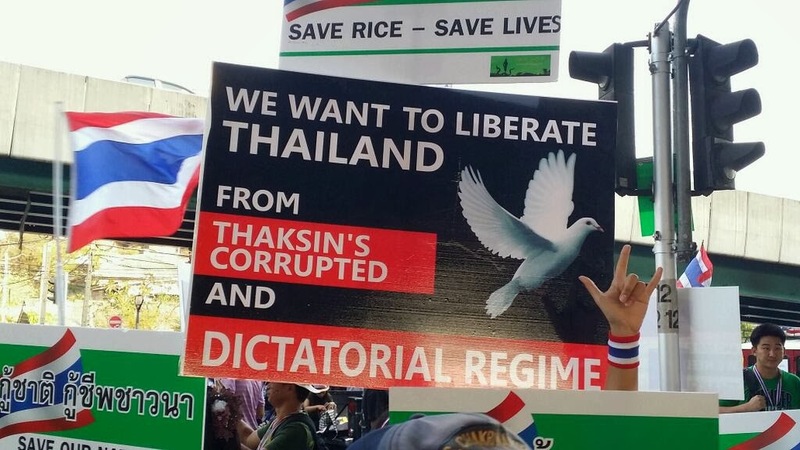 While much progress has been made regarding many of the protesters’ demands – the fact remains that Thaksin Shinawatra through his proxy regime is still clinging to power. The collapse of the regime is inevitable, but for Thaksin and his foreign backers – completely removed from any risk of continuing on in vain – they believe there is nothing to lose in search of even the faintest chance of political survival. As long as the regime clings to power, the effects of its corruption, incompetence, and criminality will continue to reverberate across Thai society. Most acutely felt is the damage it has exacted across Thailand’s agricultural industry upon which much of Thailand’s workforce depends. Mobilizing the resources of the State to solve this problem is not only untenable because the regime continues to hover above the levers of power, but also because more handouts – which created the problem in the first place – will ultimately not solve the plight of Thailand’s farmers, only compound them. The real solution to this problem is to undermine entirely the edifice on which the regime is clinging. Instead of prying its claws from the ledge, the entire edifice should be separated from the cliff’s face and sent tumbling down into the ravine below, regime and all. This requires the parallel creation of a new model for Thai agriculture – side-by-side with the dysfunctional ruins left behind by the regime. The successful creation of a parallel agricultural system could serve as a model for solving other social problems, and the first tentative steps toward accomplishing this have already been taken by Thailand’s innovative and resourceful protesters. The plight of Thailand’s farmers began in 2011 with the fantastical vote-buying promise of over-market prices per ton for rice delivered to government warehouses. Almost immediately, Thailand’s traditional trade partners avoided the overpriced grain and turned toward neighboring Asian nations. As rice sat in government warehouses long past what industry standards allow for, fumigation, fungus, and rot rendered the rice unfit for human consumption. By the summer of 2013, promised subsidy prices were first slashed before payments to farmers were altogether halted. Many farmers have now gone without compensation for rice they have already turned in, and that has long since turned rancid, for well over half a year. Compounding the farmers’ dilemma was the cancellation of the subsidy program in conjunction with intentionally delayed delivery of irrigation water for farmers to begin planting their next crop. The regime feared another deluge of rice deliveries on top of the overflowing warehouses they already have failed to sell – the delay of irrigation water was a means of buying more time at the farmers’ expense. Even as farmers now begin receiving water Thailand’s rice industry lies in such ruins, few know to whom they will be able to sell their rice and at what price. For a segment of the population already struggling against the constant fear of insurmountable debt and lacking any means to diversify their economic activity, they are facing destitution and desperation unlike anything they have seen in decades. Enter Buddhist monk and activist Luang Pu Buddha Issara, who has led the permanent occupation of northern Bangkok’s Government Complex for months. Between leading protesters and coordinating with the larger anti-regime movement, Buddha Issara has also done something novel, innovative, and rare – added pragmatism to the sea of placards found among his followers. Money raised by the various fundraising activities has gone into the purchase of a modest rice mill. The mill processes about 1 ton of rice per day, brought in by desperate farmers unable to receive compensation from the regime. The milled rice is then sealed in bags and sold to Bangkok’s city goers. The proceeds are given back to the farmers. Buddha Issara has also asked farmers to bring other forms of produce – fruits and vegetables – to the protest site to likewise be sold. It is the first step toward a farm-to-city market, short-circuiting the corrupt middlemen and rancid warehouses that constitute the failed rice scheme the regime has created. With the “Shutdown Bangkok” campaign a success, protesters plan on consolidating stages and refocusing with their newly gained momentum. The “Shutdown Bangkok” campaign was designed to coordinate pressure on the regime of US-backed dictator Thaksin Shinawatra and his proxy political machine headed by his own sister, Yingluck Shinawatra. 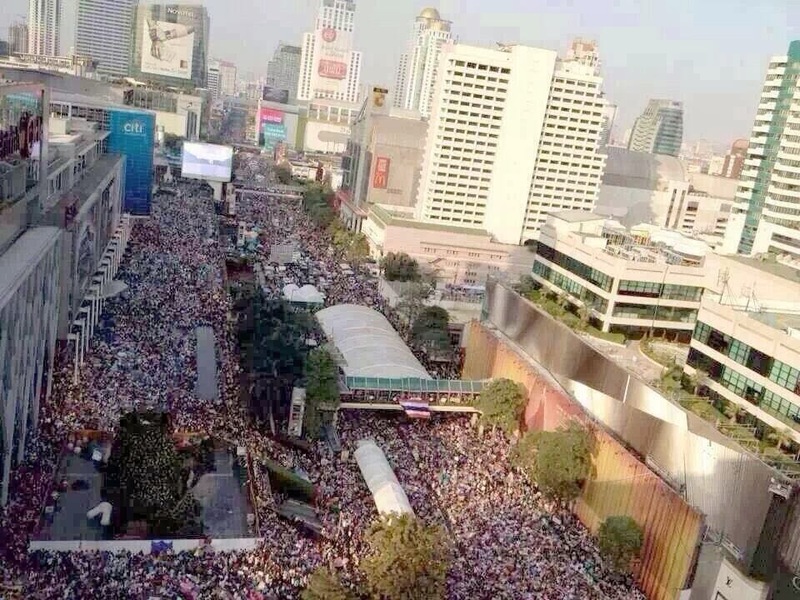 Elections held on February 2, 2014 were successfully boycotted by over half the population in an unprecedented display of unified national defiance by the Thai people. Since the elections, the regime has responded with an expanding campaign of armed terror that has left many dead, and many more horribly maimed, mainly from grenade attacks and gunfire launched by professional mercenaries, pro-regime thugs, and elements of the police loyal to the regime. Among the dead have been children. 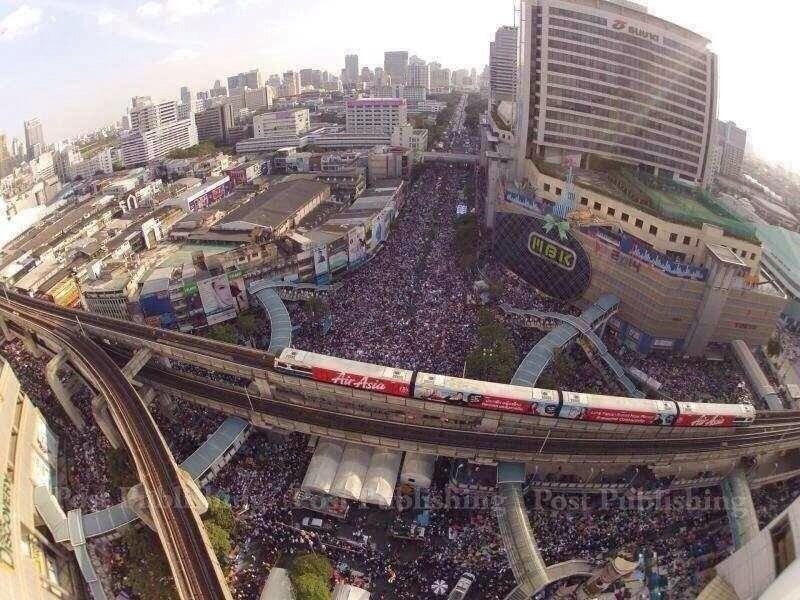 Image: Occupy Bangkok has exposed and hobbled the Wall Street-backed regime of Thaksin Shinawatra. With the February 2, 2014 sham-elections an abject failure, the campaign has been a success. The protest leaders are now consolidating stages into one single location from which they can concentrate their efforts to ease the Thaksin regime into permanent collapse. 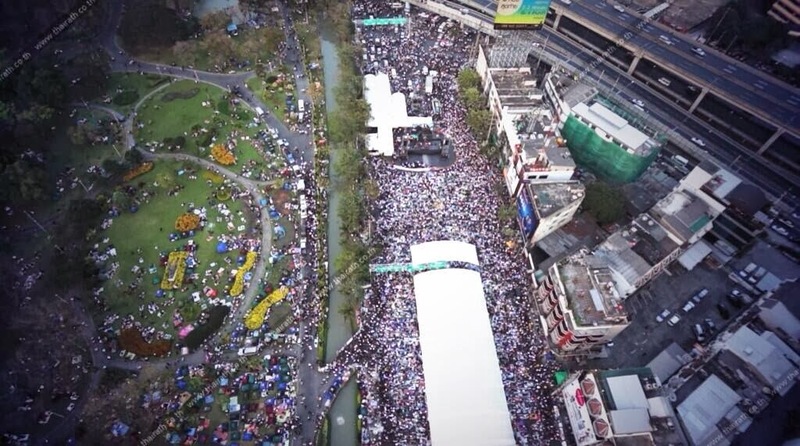 Before the city-spanning “Shutdown Bangkok” campaign began, there was a single demonstration site including two stages at and near Bangkok’s Democracy Monument. 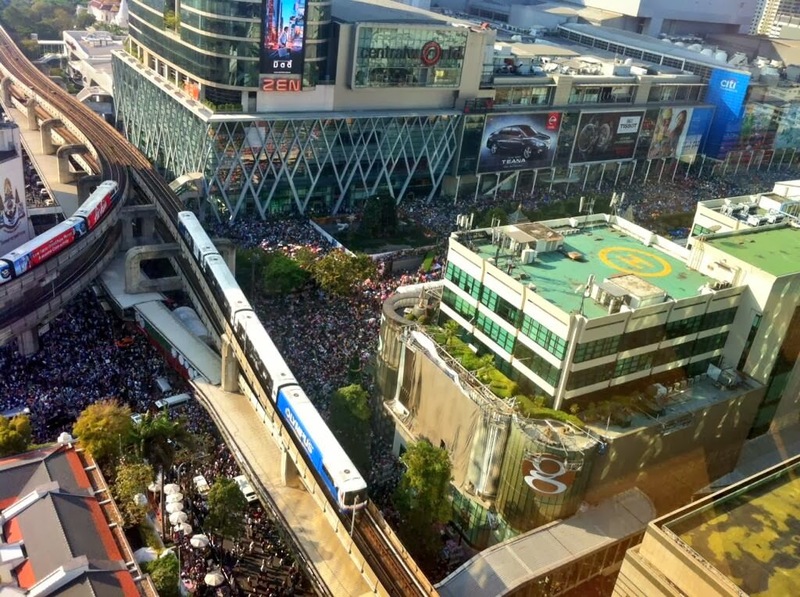 It was announced yesterday evening that beginning on March 3, all of the stages that have been set up for “Shutdown Bangkok” will be consolidated once again, this time at Lumpini Park, near the Silom business district – accessible by Lumpini MRT station and Sala Daeng BTS station. The move was long overdue – with the regime now fully exposed as both lacking any kind of democratic mandate, and resorting to violence as it clings with increasing desperation to power. The protesters at a single site can now continue organizing action against the regime, as well as direct resources toward the more impressive single-day mass protests (and the warm-up marches proceeding them) that have been the hallmarks of the months-long movement. Security for a single site will also be easier to manage. In the wake of growing terrorism employed by the regime, and the regime’s Western backers feigning ignorance over who is behind the escalating violence despite overt admissions from the regime and its supporters weeks ago published in the US State Department-linked TIME Magazine. For protest leaders, the next step is to simply wait for the regime to continue unraveling. It has lost vast amounts of support, even among rural rice farmers who have turned against the regime in the wake of the disastrous rice subsidy program that have left thousands of farmers unpaid, destitute, and desperate, and the nation’s rice industry crumbling. For the protesters themselves, organizing smaller direct action committees to develop and implement local solutions addressing a wide range of issues, from education to economics, and even helping the victims of the regime including the farmers – would be a good way to continue undermining the regime as well as move constructively toward a different paradigm beyond elections, corrupt politicians, and endless, futile political bickering. The regime is expected to continue employing violence and terrorism against growing dissent. It, along with its Western backers, have continuously peddled the narrative of a coming “civil war.” As pointed out many times before, this is not even remotely possible. Instead, the regime will use widespread terrorism and propaganda to appear as such, to make increasing violence appear to be a “people’s movement” rather than state-sanctioned brutality. Recently, the regime’s deputy secretary-general to the prime minister and “red-shirt” leader Suporn Attawong claimed he was assembling a 600,000-strong “pro-government Democracy Protection Volunteers Group,” as reported by the Bangkok Post’s article, “Red shirt hardliner seeks 600,000 men.” With the regime failing utterly to fill even a single stadium in Bangkok to counter massive and prolonged anti-regime protests, the prospect of assembling an able-bodied army of 600,000 men is slim to none. The regime’s ludicrous posturing heralds increasingly desperate moves as it attempts to cling to power. However, the protests are growing, well led, determined, and highly motivated. Their patience and prudence has and will continue to work against the regime – with the regime’s attempts to strike back only expediting its fall. THAILAND (INTELIHUB) — Live rounds are being used, including grenades, in anti-government protests as hundreds of injuries have been reported, some fatal. It was also reported that a protest leader was briefly captured by police, causing mass chaos to ensue. Grenades were even lobbed at police killing some and blowing limbs off of others. Reports said that as the police withdrew, protestors ramped up their barricades and awaited another push. Things are expected to worsen. With a regime and system rendered illegitimate with a sweeping boycott of sham elections – Thailand must find alternatives to patching itself together beyond the broken ballot box. 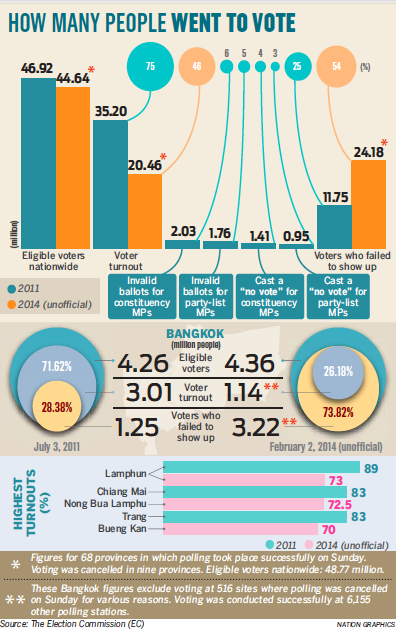 February 5, 2014 (ATN) – Thailand’s February 2, 2014 elections produced the worst ever voter turnout in Thai history with a humiliating 46% coming out to cast their ballots. Of this paltry number, many chose to deface their ballots or cast “no vote” in protest of both the process and the regime overseeing it. The elections were highly controversial, with all major opposition parties boycotting them and the only major party on the ballot being openly run by an accused mass murderer, convicted criminal, and fugitive, Thaksin Shinawatra, who is currently hiding abroad from a two year jail sentence, multiple arrest warrants, and a long list of pending legal cases. The elections were carried out with heavy backing from the West, despite the obvious illegitimacy of the process and the nature of the regime. While the West claims it was merely defending the “democratic process,” a look into the relationship between dictator Thaksin Shinawatra and the corporate-financier interests of Wall Street and London tell another, more likely story of imposing upon Thailand a proxy regime serving Western, not Thai interests. The Election Commission (EC) today released the latest voter turnout for February 2 general election at 46.79%, with turnout of “vote-no” standing at 16.57%. The turnout was counted from 68 provinces, excluding nine southern provinces where voting could not be held, and some constituencies of Rayong and Bangkok. Of the 68 provinces where voting was held, EC said there are a total of 43,024,042 eligible voters. It said 20,129,976 voters or 46.79%, cast their votes. Of all the ballots they casted, 71.38% was valid, and 12.05% was void. It said of all the valid ballots, 16.57% voters casted “vote-no”. With over half of all eligible voters choosing to not even vote, and with so many defacing their ballots or choosing the “no vote” option, the ruling regime of Thaksin Shinawatra has clearly lost millions of votes since 2011. It should be noted that turnout percentages are determined based on polling stations uninterrupted by protests – though areas where voting was disrupted are expected to produce results even less favorable for the regime if and when voting occurs. It is clear that the regime has lost the confidence and support of the vast majority of the Thai population and is now without a mandate to rule the country. Furthermore, Thais appear to have lost confidence in the so-called “democratic process” the regime has hijacked in order to create the illusion of a mandate and legitimacy. Despite this, the regime’s Western backers continue to promote the myth that merely because “elections” took place, whatever government is formed afterward possesses unquestionable legitimacy. And with this “legitimacy,” Thaksin Shinawatra and his political party are attempting to arrest an opposition that clearly commanded the majority of Thai opinion on February 2. The Criminal Court on Wednesday approved the Department of Special Investigation’s (DSI) request for arrest warrants for 19 leading members of the People’s Democratic Reform Committee (PDRC) for alleged violation of the emergency decree. To compound the regime’s authoritarian posture, it should be noted that the emergency decree was announced in response to a terror campaign the regime itself openly carried out against the opposition. It included almost nightly drive-by shootings at rally sites and opposition leaders’ homes, as well as brazen broad daylight grenade attacks that left one dead and scores seriously maimed. While the regime and the West will continue framing the elections as a renewed mandate for Thaksin Shinawatra’s illegal, illegitimate administration of Thailand, and the opposition as ostentatiously opposing the will of the rural “majority,” the reality is that this rural majority joined the opposition on February 2 in boycotting the polls and are literally joining the protesters in Bangkok in response to the regime’s collapsed rice-buying scheme. The illusion of Thaksin Shinawatra’s popularity has been shattered and the barriers of fear imposed upon the Thai people by his “red shirt” enforcers have crumbled into ruins. With wrecking-ball abandon, his regime has gutted Thailand’s rice industry, skewed the economy, shaken confidence both domestically and abroad, and is still awaiting the fallout from other disastrous vote-buying schemes that are in the process of collapsing. What the protesters have been unable to do themselves, the regime itself will accomplish in the final stages of its grip on power. However, people need not wait to begin picking up the pieces the regime’s corrupt, incompetent ministries have left after their ruinous decade in power. While a new government will inevitably replace the Shinawatra regime, the lessons of the past decade should inform the Thai people that the answers to their solutions lay not at the ballot box, but in their own hands. While Thailand’s education system, agricultural industry, banking system, infrastructure, and other essential services provided by the government cannot be easily replaced, they can be augmented by local activism, local institutions, and local collaboration to make up for shortcomings that may or may never be addressed adequately. Protesters who have been meeting and organizing to attend mass rallies, supporting the alternative media in their efforts to counter the regime and its Western backers’ propaganda, and volunteering at the rallies themselves can begin expanding their activities toward tangible solutions and enumerated, specific principles of reform. The “fee tablet PC” scam by the government was a bad idea even if it was implemented efficiently. The problem with the Thai education system was never a lack of tablet PCs, but a lack of resources to match qualified teachers and practical curriculum to appropriately sized classes. A real solution could include a Thai-version of OpenCourseWare where curriculum is available for free on the Internet in a centralized repository including both free .PDF textbooks and video lectures on YouTube, along with resources to help educators and potential educators impart the curriculum upon students. This can be done in parallel with the existing education system and offered in after-school programs. It can be lucrative and beneficial to both educators and students within their village or district. This can include anything from improving or augmenting local IT infrastructure, to developing cheap and easy-to-replicate technology to assist farmers in both increasing their efficiency and diversifying their economic activity. Local institutions like hackerspaces that combine education, technological research and development, and a venue for meeting and organizing for a wide variety of pragmatic purposes, can also serve as a nexus for disaster response – another area in which the current regime has consistently and tragically failed. An example of a political movement turned pragmatic was Occupy Wall Street, which in the face of Hurricane Sandy, became “Occupy Sandy.” It turned its political networks into pragmatic disaster relief networks, and illustrated their political struggle with Wall Street and the proxy regime it controls in Washington, could be outmatched by its pragmatic response to that regime’s failure in the face of adversity. The Occupy Sandy movement proved that the US government’s failure was not because the odds were insurmountable, but because the government simply did not care. The lesson is that the only people who care about us, are ourselves, our friends and family, and our community. To solve our own problems, we must find the solutions within and among ourselves. Hackerspaces: A space – perhaps a shophouse – with tables for people to gather and collaborate on practical projects such as IT, hardware, robotics, electronics, fabrication, woodworking, etc. Most hackerspaces fund themselves through a combination of monthly dues from memberships and through classes organized to teach skills or discuss concepts. The space is very flexible, and can even be used for local meetings, after-school tutoring, and social events. Farmers’ Markets: With the disastrous rice-buying scam collapsed in corruption, scandal, and bankruptcy, farmers across the country are left with empty hands and a wrecked rice industry. Should these farmers possess the skills to produce organic fruits, vegetables, and livestock, and should urbanites both in provincial cities and in the capital create markets for them, an additional source of sustainable revenue can be offered while deeply entrenching a healthier, local agricultural industry across the nation. For example, organic farmers’ markets could be created across Bangkok, who independently or cooperatively promote their locations, operating hours, and the farmers they network with. Tours to the farms producing the food can also become a part of the new economy, with new media writing about the health benefits of organic farming versus industrial big-agri. An industry of the people, by the people, for the people is the only true way to achieve real, sustainable, and meaningful “wealth distribution.” The technology and resources already exist to make this a reality – a reality already unfolding among dissatisfied Americans seeking an exit out from under the Fortune 500’s corporate-financier monopolies. The legal and regulatory barriers these monopolies are using to stem the exodus of consumers into producers do not exist in practice in Thailand. 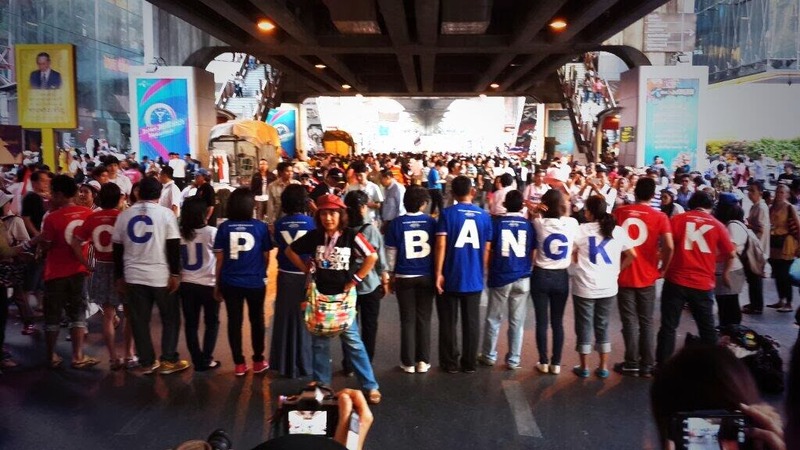 For Thais, the only barrier may be a lack of understanding that the solution is right before us. Understanding it, however, allows us to take the current momentum of the political surge against Thaksin Shinawatra and the corrupt system he represents, both in Thailand and globally, and turning it into a pragmatic and lasting movement that will finally allow us to make good on the promises perpetually made and broken by self-serving politicians. 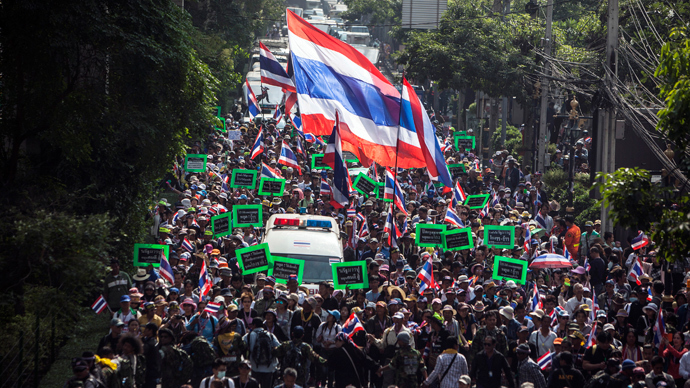 January 30, 2014 (ATN) – While the US, UK, and others across the West attempt to sell upcoming sham elections in Thailand as upholding “democratic values,” the regime overseeing the one-party self-mandate in a climate of regime-sanctioned terrorism, political intimidation, and a “state of emergency,” has begun turning on its own supporters – mainly farmers. As protests began to spread across the north and northeast of Thailand, considered Thaksin Shinawatra and his regime’s stronghold, and with other farmers headed to Bangkok to join the “Occupy Bangkok” campaign, the regime has begun turning its notoriously violent “red shirt” enforcers on the farmers – most of whom, according to the BBC, AFP, Reuters, and others constituted the regime’s support base. Towards the Destabilization and Breakup of Thailand? The Economist has recently floated a narrative that the current Thai regime could flee to the north and “separate” the region from Thailand. Far from a legitimate government seeking to “preserve democracy,” it a Western-backed proxy regime carrying out the tried by true modern imperial agenda of divide and rule. First, it should be remembered that the Economist publishes paid-for op-eds. It is not news, it is not analysis, it is simply the message told by the highest bidders – the corporate-financier interests of Wall Street and London. These interests are passed to the Economist via their impressive network of lobbying firms. The Economist itself sits among the corporate membership of large Wall Street-London policy think-tanks like the Chatham House, right along side these lobbying firms. 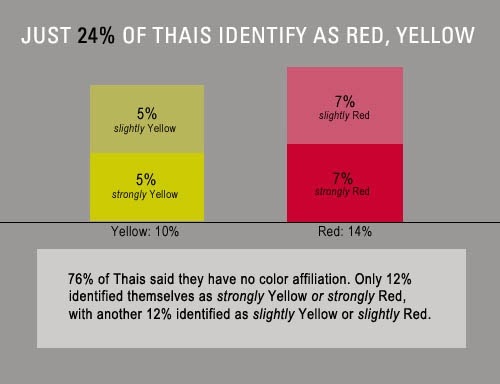 Indeed, many red shirts say Bangkok is already lost. Mr Suthep has nearly free rein there, closing down most government offices. The police have charged him with insurrection and seizing state property, but no attempt has been made to arrest him. The imposition of a state of emergency for 60 days may not make much difference. Thus most red shirts in the north and north-east now contemplate—indeed they seem to be preparing for—a political separation from Bangkok and the south. Some can barely wait. In Chiang Mai a former classmate of Mr Thaksin’s says that in the event of a coup “the prime minister can come here and we will look after her. If…we have to fight, we will. We want our separate state and the majority of red shirts would welcome the division.” Be afraid for Thailand as the political system breaks down. Thaksin Shianwatra is at the very center of Thailand’s current political crisis which includes the ongoing “Occupy Bangkok” campaign that has paralyzed the government for now nearly 2 weeks, and has drawn out the largest street protests in decades. Pro-government rallies have fizzled and many of the regime’s supporters, including rural farmers have in fact joined the opposition after being cheated in a vote-buying rice subsidy scam that has gone bankrupt and left them unpaid now for nearly half a year. Graph: Up from 62% the year before, the public perception of the military as an important independent institution stood at 63%. Even in in the regime’s rural strongholds, support stood at 61%. 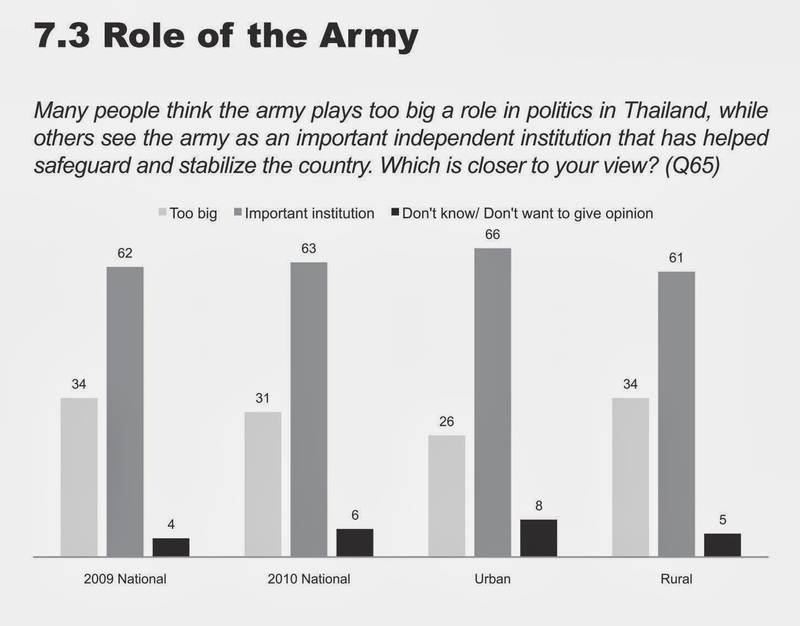 The only individually polled group that did show majority support for the military, was the regime’s tiny “red” minority, but even among them, 30% still supported the army. .
For Thaksin Shinawatra and his proxy regime, it has only lost support since the 2010 survey was conducted. In the 2011 elections, despite being declared a “landslide victory,” according to Thailand’s Election Commission, Thaksin Shinawatra’s proxy political party received 15.7 million votes out of the estimated 32.5 million voter turnout (turnout of approx. 74%). This gave Thaksin’s proxy party a mere 48% of those who cast their votes on July 3rd (not even half), and out of all eligible voters, only a 35% mandate to actually “lead” the country. Hundreds of thousands of protesters, hundreds of vehicles permanently occupy intersections across Bangkok in opposition of Wall Street-backed regime. January 13, 2014 (ATN) – The fourth, and largest mass mobilization yet by protesters seeking to rid Thailand of unelected dictator Thaksin Shinawatra and his proxy regime, has filled the streets of Bangkok with hundreds of thousands of protesters, turning sections of the city’s roads into walking streets, campsites, stages, and protest areas. Images: Scenes from just a few of 8 major protest sites where permanent encampments have been made and have drawn hundreds of thousands of protesters the first day. Each encampment is surrounded by hundreds of vehicles, tons of supplies and equipment, for the permanent occupation of Bangkok’s streets until the end of Thaksin Shinawatra’s proxy regime.